Electrical safety at work kicks up a notch with strong advice from OSHA trainer Jon Koppari. Hear Jon’s tips for safety managers, owners and workers. In 13 short minutes, Jon covers lockout/tagout; arc flash PPE, arc flash labeling, NFPA 70E regulations and much more. Jon even explains why birds aren’t electrocuted when they rest on power lines. Jon Koppari is a certified trainer for construction safety, NFPA 70E, and CPR/AED for The Occupational Safety and Health Administration. Prior to his work with OSHA, Jon was an industrial safety manager. Dan Clark conducts the interview with Jon from his desk in Arlington Heights, Illinois, at the OSHA Directorate of Training And Education. Jon Koppari: Electricity is one of those that is very unforgiving. It only takes that once for someone to get shocked. Dan Clark: Electricity is just organized lightning. That’s what George Carlin said. So, that means a power outlet at work, or at home, can be just as dangerous as a bolt from a cloud. Hello, I’m Dan Clark, and today we’re talking with Jon Koppari, Specialist Instructor for OSHA. Jon has a long history of safety management in the workplace, and now is a certified trainer in construction safety, CPR/AED, NFPA 70E electrical issues and many more. Today we’ll focus on electrical safety at work. Hi, Jon. Dan: How is the OSHA Directorate of Training and Education there in Arlington Heights, Illinois? Dan: Good. Well, Jon, let’s talk about electricity safety. Many listeners to this podcast are safety managers, or first-time safety managers. Dan: How can a safety manager, who’s not an electrician, look for electrical dangers? Jon: Well, the best way for a facility safety manager to be aware of these electrical issues is to perform regular inspections of his workplace, either by himself or with the qualified electrician, if they have one in their facility. This would help the facility safety manager be aware of the electrical issues in their facility that are covered by our standards, and are also on the OSHA top 10 violation list. Making sure that they’re using listed and labeled electrical equipment, in accordance with the listed instructions. They can be on the lookout for examination of electrical equipment for damage, which could injure the employee. Effective coverings of unused openings in breaker boxes or panels or on the outside. And making sure that they’re looking for guarding of live parts from accidental contact. Dan: Any training that you would recommend for a safety manager to recognize hazards? Jon: One thing, I think, for a safety manager is to look into our OSHA standards, which is the OSHA subpart S for general industry. And this is our 1910.303 to .335. And this gives clear guidance on how to identify any kind of hazards starting from the live parts, to unused openings. Jon: What type of wiring (the correct way to wire a system), grounding techniques. Jon: This also covers safe work practices. So, it would tell an employer or the safety manager how to do the work live—if they need to—but, also, how to properly electrically lockout/tagout the system. Dan: One more time, if you would. What is that chapter number in your document? Jon: Subpart S of the 1910 general industry standards. Jon: In subpart S, it’s .303 to .335. Dan: Great. We will link that in the transcript of this podcast on our website, CreativeSafetySupply.com so everybody can read it. Jon: Right. And it’s available for the public. Dan: Okay, that’s good. Can facility electricians legally provide information—do a toolbox talk in the building—or, must an employee be trained only by certified trainers? Jon: Well, toolbox talks are a great way to get information out. As a facility electrician, they can provide the toolbox talks for the employee training. As long as they’re qualified electricians, they’ve received their proper training. One of the things that the toolbox talk, it should be effective enough to convey the message that helps the worker understand how to identify those electrical hazards and dangers. How to properly inform their supervisor of the hazards. How to protect live parts, or how to identify them and contact the supervisor or the electrician. Proper electrical lockout/tagout techniques so that the electrical side of a piece of equipment is properly deenergized, and verified, and safe to work on. Proper grounding techniques is the simplest one, too. For flexible cords that are being used to make sure that the cord is in good shape and that the grounding pin is still in contact and working properly. Dan: Well, let’s march onto lockout/tagout. It’s always one of the top 10 OSHA violations every year. I know why you need to do lockout/tagout, but can you give us some examples of issues you’ve seen in the quick fixes? Jon: Yes. I guess some of the issues I’ve probably seen is more the verification stage of electrical lockout/tagout, which includes that a worker verify that the equipment is properly deenergized. Sometimes, the equipment will just be deenergized and then they’ll think to go to work instead of having a qualified electrician verify with a multi meter to check that that panel board is actually deenergized so that the worker can safely work on that equipment. Dan: I know what you mean about that. Even if the switch is off, there may be a capacitor somewhere in line with stored electricity that could shock the heck out of you. Dan: Ah, I tried to fix my own air conditioner. One of those cooling towers thats, you know, 15 years old. And it was dying, and I went in there and started turning apart. And I didn’t realize there’s a, a huge, fat thing that looks like a big can of beer, but it’s a capacitor full of electricity I could’ve been nailed by that. Dan: And, and, so people have to be very careful, and I think it’s really important that you mentioned having somebody verify that that circuit is dead. Jon: Because, also, the electrician is going to verify that not only the capacitor, which stores energy, but any accidental re-energization. A back feed, if a line were to touch another line. Jon: The back feed into the system. So this electrician is, or as we call it, the “qualified person,” is going to check for this stuff to ensure that it is properly deenergized and ready to work on. Dan: Good. Okay, let’s go on to other things. What are some of the common electrical violations you see in the workplace? Jon: Some of the common violations that we might see. A worker performing live energized work instead of doing a proper lockout/tagout. Not wearing the appropriate arc-rated gear while performing live work. So, we’re talking about the clothing, and the gloves, and the face shield or the, the hood, which is also called a balaclava. And this stuff is to protect the worker against an arc blast or an arc flash, which is the most dangerous part of any electrical work. And then, of course, one of the last things I can think of is not providing proper training for your unqualified workers that are working near, like the apprentice who is helping out, or someone that’s just in the general area while someone’s performing live work. And this unqualified person still has to be trained on the safety hazards that are in the area so that he or she knows not to go into the work area, so that they don’t get shocked or electrocuted. Dan: Very good. 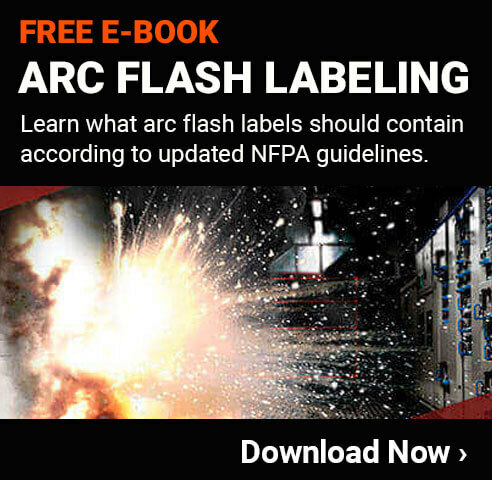 When doing arc flash labeling, do companies need to include all of the information, or just warn that the presence of an arc flash hazard exists? Jon: Well, for arc flash labeling, it should be effective and communicate the appropriate message. So, I would say that the arc flash labeling should contain, at the bare minimum, what the infinite energy is—meaning in calories per centimeter squared—what is that intense energy blast going to be. The proper working distance the qualified person is going to work from. And this is, usually, they’re allowed 18 inches. This label should also include the flash and the shock boundaries that need to be set, so that unqualified people know that they are not allowed to enter these areas so that they’re protected against electrical shock, and if there was an arc blast they’re protected against that for not wearing the appropriate clothing. And then the last thing, I think, at a minimum, it should also include the required arc rated clothing that is necessary to do the live work under the hazard risk categories. And having all that information on there will provide the qualified person the necessary means to properly wear the stuff, to set up those boundaries and protect themselves in case something does happen doing the live work. Dan: Okay. So, a company has all this arc flash material and regulations passed on to the employees. But, occasionally, rules change. Ah, how often should a company check for changes? Jon: Well, with the National Fire Protection 70E—it’s a consensus standard again. And they update it every three years. Jon: So, for best practices, a company should check with the NFPA 70E. It’s the most current and best one right there. Dan: Very good. And a final question, and this one, Jon, comes from my son. Why don’t birds get shocked when they sit on power lines? Jon: I love this question. In the safety world, we consider the “bird on the wire” the safest thing out there. The reason is—the most technical reason is—is that the bird shares the same potential with the alternating wave, or the AC current. It doesn’t complete the circuit because as the wave pattern goes from a positive to negative, positive, negative, the bird just sits shares the same potential. So, say for instance, that bird is sitting on the one line and he was able to reach his leg, if his legs were long enough, and to reach over to another power line. Now, he would have a difference in potential. Whereas, one leg would be sitting on a line and it’s a positive side. And on the second line, which is on another part of the wave, he’s on the negative. And we call that a difference in potential. He would complete the circuit and would be shocked. Jon: (laughs) Well, it’s not so much for the birds. It’s to allow, ah, there has to be a spacing difference to allow workers to climb up there like an electrician lineman to get between those areas, if he has to climb the poll to get up to higher elevations. And also, to prevent wires, when they swing, from touching each other. Dan: Of course. Well, my son says thank you very much for that answer on birds on wires. Jon: I hope it helps him out. Dan: Well, Jon, we’re down to the, ah, last thing here. Any final thoughts on workplace safety and electricity? Jon: I would just say, again, one of the best ways to look out for electrical hazards is for the facility manager to get out into the space and do regular inspections, for the workers to be on the lookout. And, one of the easiest methods is to look for live, energized parts that are not protected from accidental contact. Anything that’s open, bare wires, someone should be reporting it. Electricity is one of those that is very unforgiving, and it only takes that once for someone to get shocked or electrocuted with electricity. Jon: Alright, thank you, Dan. Dan: Our guest is been Jon Koppari, Specialist Instructor for OSHA, and we’ve been talking with him from his office in Arlington Heights, Illinois. I’m Dan Clark.